According to Cloud Adoption 2018 War report by Bitglass, the usage of Office 365 among organizations globally has reached over 56% in 2018, up from 34% in 2016. Office 365 is a rapidly growing technology platform for enabling collaboration. Because of the great features such as security, reliability, Microsoft Office 365 apps, and SharePoint Online, organizations are inclined towards Office 365. Additionally, the incredible amount of value it adds with collaboration between individual employees, teams and departments is fueling the investment in Office 365 suite. According to Gartner, 33% of businesses will adopt cloud-based office suites by 2017 and 60% by 2022. Yet, many organizations are struggling with o365 adoption which is taking a toll on the investment made. Success factors impacting Office 365 adoption has to do with multiple reasons including the resistance of adopting the new technology among staff. While your IT team is pouring in its best efforts to ensure an error-free deployment, there seems to be an unnoticed gap building between the end users and their adoption of new technology. Often IT teams fail to make the users realise the promising benefits that a technology platform like Office 365 can bring in. Most strategies behind technology initiative come with an expectation of noticing results from day one of successful implementation. But businesses fail to understand that just turning on the efficient technology switch to enable collaboration does not guarantee adoption on the fly. Motivating your team to adopt new technology has to counterstrike employee resistance to change and bring in acceptance. Much of Office365 value and ROI is justified when employees understand and adopt the technology that has been implemented. So how can you drive faster, sustainable and effective o365 adoption? Go through below tips to ensure a successful Office 365 adoption. Most of the office 365 implementations fail to attain a stature of success due to lack of vision in identifying business scenarios influencing their adoption mechanism. A clear, concise vision acts as a powerful tool in aligning the initiative with employee expectations. Critical success factors impacting office 365 adoption involve establishing a clear understanding of the business outcome. Additionally defining a clear understanding of who your users are and what’s in o365 for them amplifies your overall adoption rate. Employees have different goals, pain points and ideas of what success looks like. If expectations and purpose match then the adoption is bound to happen. So, focus on solving business problems, not just technology. Leadership is the key driver of relationship building, innovation and productivity. Appointing leaders and educating them on the benefits of Office 365 like team collaboration, central streamlined communications and transparency of work can help to exploit the full capabilities of O365 within your organization. Identify O365 champions and embrace the change to leverage the power of office 365 suite. This corrects the mistake of ignoring the human side of things in implementing a technology. Fostering awareness on Office 365 is another best way to drive adoption. It helps in creating a “buzz” around the new product or technology. Awareness programs can motivate and inspire employees about the business value that Office 365 tools can add to simplify their work dynamics. Build your awareness strategy with a mix of emails, posters, and experience stories to sprout excitement about new technology. Show employees what’s in it for them. Clearly, communicate goals and milestones. Tailor your language and target your audience. Also maintaining a “go-to” resource centre that provides access to video tutorials, wiki articles and searchable answers to queries can help employees with self-serve options and alleviate calls to the help desk for basic questions. AI-powered chatbots bring deeper natural language understanding to not only enhance search but also empowers employees to interact effectively – boosting adoption rate. 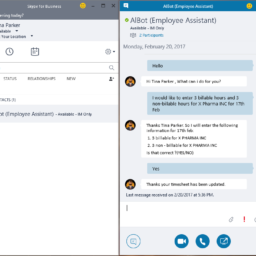 AI-powered Office 365 chatbots have immense potential to instantly sync with your office 365 applications and change the adoption scenario. They have the capability to assist employees in extracting data and keeping your employees more engaged by performing the desired action on Office 365 tools with better ease. Accessing resource centre for training videos, guides, documents etc on the go. Streamlines the flow of communication across the organization. Scheduling meetings, tasks in Outlook and create groups in teams. Managing basic support tasks like password reset, application management, answering FAQs etc. They help in improving overall productivity by streamlining operations, ensuring seamless assistance boosting Office 365 adoption. Interested to build Chatbots for Office 365? Learn more about BotCore – an enterprise chatbot builder platform. We are just not there once you are done with prepping up your employees and the launch of Office 365. Measure the utilization and identify shortfalls to enhance the engagement. Excerpting insights can help in measuring Office 365 performance furthermore making decisions about the next plan of action. Using the Office 365 Admin Console, measure user-level statistic reports and identify tools that are underutilized. Collect these insights from your evaluation process to kick off additional training to educate users about best practices and high-impact Office 365 solutions. Time: To know when and where it happened. Visuals: Picture what has happened. Success stories about business value can easily be shared internally using the collaboration tool ‘Yammer’. Leveraging Office 365 solution can help your organization to shift towards the changing expectations and help your employees be more connected, collaborative with a single suite solution for the modern digital workplace. Employees can easily access all Office 365 services, tools or applications through one cloud-based entry point wherever, whenever they need to get work done boosting efficiency and productivity. Ready to start your Office 365 adoption? Check out Mesh – A modern Office 365 solution combines all features of Office 365 and SharePoint online and provides a unique solution that helps to drive global communication and collaboration. Schedule a demo now.